With the approach of spring, Xinxiang Yulong Textile Co., Ltd. welcomed two customers from Bangladesh in south Asia on March 28th. Bangladesh’s climate is damp and hot all year around and so many rivers make the customers have the special requirement of fire retardant coverall. After the deep communication, we know that customers firstly require the fire retardant coverall has the excellent fire protection, anti-static, anti-arc and tear resistance performance, secondly require the fire retardant coverall has the strong air permeability, which will make the workers feel comfortable in the hot and damp climate, thus reducing the happening of sunstroke of workers for the air proof feature of fire retardant coverall, saving the physical power of workers, prompting the working performance; thirdly require the fire retardant coverall has strong hydrophilia and is easily to be washed, which will make the workers easily wash their coveralls after the hard work. According to the requirement of this Bangladesh customer, our company recommend one classic product-YL-CO225# fire retardant coverall for the customer. The YL-CO225# fire retardant coverall is the flagship product of Yulong for many years, which is a continuously upgraded and excellent fire protection clothing passing the double test of large number of customers and time. This fire retardant coverall adopts selected long stapled cotton and premium polyester as the basic fabric of product, has the special advantages of wear resistance, air permeability and comfort of CVC fabric, which can satisfy the high requirement of customer for the comfort of fire protection clothing, meanwhile, the coverall is produced by using the special technology of Xinxiang Yulong Textile Co., Ltd. which has the good fire retardant performance of fire proof, anti-arc, anti melting drop. The coverall can provide the real high temperature proof for the wearer, besides, after many improvements, this YL-CO225# fire retardant coverall increases the good performance of high strength and washable, so the product quality is promoted further and win the preference of more customers, which is suitable for many workplace such as fire protection, forest protection, oil drilling, mechanical processing, offshore oil and gas fields, oil refineries etc. After the detailed introduction and explanation of our company personnel to the YL-CO225# fire retardant coverall, these two Bangladesh customers were very satisfied with the coverall, decided to purchase in bulk, and showed their strong interests to the other products of our company, wanted to cooperate with Yulong for long term. 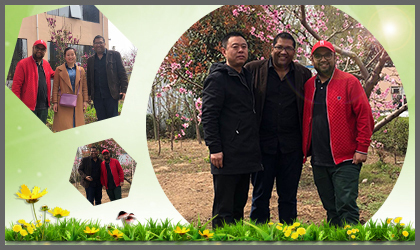 After the sign of agreement, Bangladesh customers took photos with the representatives of Yulong in our clothing factory, and highly praised the beautiful spring scenery of Xinxiang. For this, our company also hope our cooperation with Bangladesh customers can like the spring, which is flourishing.